Pets are part of the family for many older people so being separated from them if the owner has to go into care causes unnecessary upset. A new survey by Anchor, England’s largest not-for-profit provider of care and housing for older people, has shown that the majority of people think they cannot bring their pets with them when they move into care. That’s despite Anchor and other care home providers encouraging older people to bring their pets with them. The poll of 1,001 men and women in the UK over the age of 65 found that 80% of them wrongly assume care homes do not allow you to keep a pet, or are unaware that you can. The research found that 63% of people over the age of 65 think that getting older reduces their chance of being able to keep a pet, with 51% of older pet owners worrying about a future without their beloved animals. The findings also highlight the many benefits that pets can have on older people: 62% of over 65s say having a pet makes you less lonely – a figure not to be overlooked considering that loneliness increases the likelihood of mortality by 26% (Campaign to End Loneliness). Furthermore, in addition to offering companionship, 37% of older people think pets boost your chances of meeting new people. Showing the true meaning of creature comforts, 30% of over 65s think a pet reduces feelings of anxiety and 28% believe they increase happiness. Whether walking the dog or chatting to the budgie, other benefits include pets’ ability to get older people up and about more often. 55% of over 75s think owning a pet encourages you to be outside more often, while 45% think they make you more active within the home. And this is why many of Anchor’s care homes have their own pets: Birchlands in Englefield Green and Abbeywood in Ash Vale, both in Surrey, embrace this. Birchlands resident Jackie Wilson said: “I love animals because we used to have a Yorkshire terrier dog. They are good company. 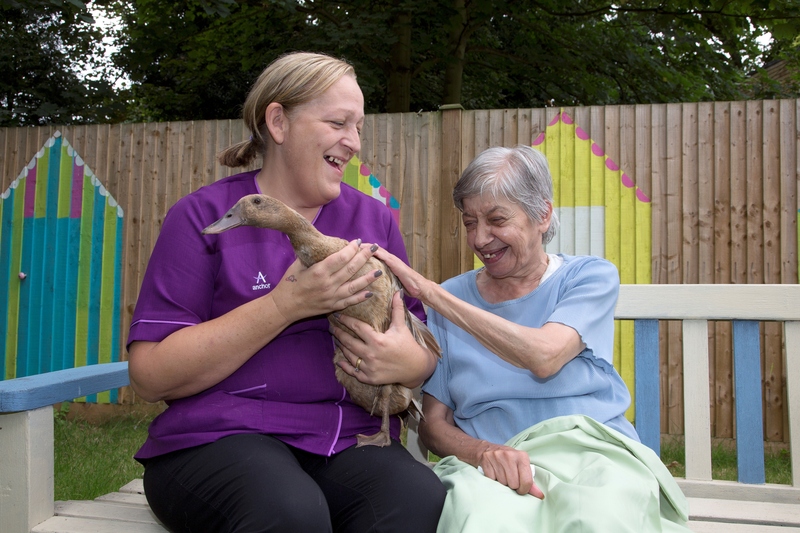 “We enjoy feeding the animals in the garden of the care home and playing with them three times a week. My favourite is the duck. Amidst suggestions that robotic pets would be a welcome solution for loneliness among older people, the research identified older people’s preference for the real thing – with just 4% saying they’d opt for a robot pet over a real one. “At Anchor, we see pets as part of the family so it’s only right that our care homes and retirement housing properties have a welcoming pet policy that encourages residents and their animals to stay together. We consider the impact that each new pet would have on residents already living with us and make arrangements accordingly. Next Article The Healthcare Sector vs GDPR: Its everywhere but is it as bad as we are being told!